New Delhi : Experience the romance of the desert this November as Mahindra Open Sky makes its debut on the first dune of the Thar Desert. An experiential celebration of music, adventure and culture, Mahindra Open Sky will be held from November 24 – 26, 2017 at Reggie’s Camel Camp Osian, near Jodhpur. With a specially curated line-up of Indian and international artists coupled with unique experiences, this unique festival has been designed as an intimate setting for just 500 seekers over two magical nights and three days in the Desert State. “With its immersive experience of culture and adventure, Mahindra Open Sky celebrates the romance of the desert and embodies the spirit of ‘Live Young Live Free’. Set against the backdrop of the mighty Thar, it presents a unique opportunity to be part of a collective of souls with common interests and passions,” says Anand Mahindra, Executive Chairman, Mahindra & Mahindra Ltd.
“Our Cultural Outreach initiatives are carefully conceived to strengthen art forms as well as provide culturally rich experiences. Our newest project, Mahindra Open Sky has a multitude of offerings that unfold against the majestic backdrop of the Thar Desert. From dune bashing in the iconic Mahindra Thar to enchanting performances by contemporary Indian musicians, it promises to be an experience you will want to relive each year,”says Jay Shah, Head, Cultural Outreach, Mahindra & Mahindra Ltd. 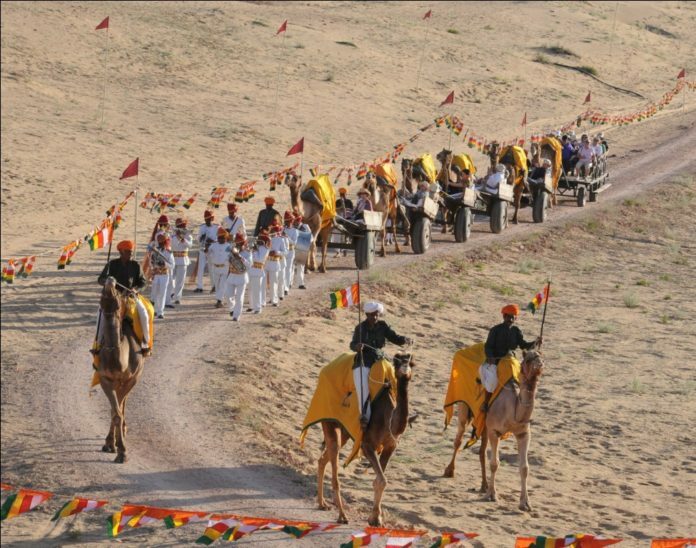 The experience will be hosted at Reggie’s Camel Camp Osian, near Jodhpur, which boasts of a royal lineage. Housed in a fortified structure, it features a full-size camel racing track, a lush, manicured garden, swimming pool, bars, dining and lodging areas, viewing decks and more. Located 65 kms from Jodhpur, the ancient village of Osian is the gateway to the Thar desert. It is famous for centuries-old temples and proud local tribes such as the Bishnoi and the Bhils and craftsmen including potters, weavers and more. The area also abounds with desert wildlife with Bluebulls, Gazelles, Foxes, Peacocks and Partridges making this unique location their home. Off-road Driver Course: Learn how to handle big, burly 4x4s in their element as experts introduce you to the basics of off-road driving on advanced vehicles such as the Mahindra Thar CRDe 4×4 and the Mahindra Scorpio 4WD. Mini Expedition: A 2-hour guided tour of the amazing local surroundings. Experience the royal hospitality of Rajasthan at the wheel of a Mahindra UV and enjoy the countryside on an easy-going short road trip through the Thar Desert. Start your day with an energising wellness session by Deepika Mehta, followed by an array of experiences including camel races, Champagne sunsets, sundowner sessions, romantic dinners on the dunes, bonfire and barbeque nights, star gazing, and film screenings under the stars. The evenings will come alive with soulful music by artists such as Piyush Mishra , Ayushmann Bhava with Ayushmann Khurrana, Papon Live, Parekh & Singh, Anand Bhaskar Collective, Donn Bhat + Passenger Revelator, Nikhil D’Souza and Sam Lewis. For those travelling from Mumbai, Mahindra Open Sky offers option of an exclusive charter flight for the experience, in partnership with Jet Airways. Fly along with fellow seekers and begin your Mahindra Open Sky experience with a luxurious flight in the open skies. Guests from other cities can avail of special discounts on Jet Airways flights to Jodhpur. The Mahindra Open Sky Festival is promoted and produced by Oranjuice Entertainment.